A gorgeous corporate gift, or something different for those in-laws that have everything: boxed cherries, picked and packed to order for guaranteed freshness. Third generation cherry grower, Stephen Riseborough, says the cold winter we had was good for something: combined with the warm spring days, a bumper crop of large, sweet cherries was waiting this year. 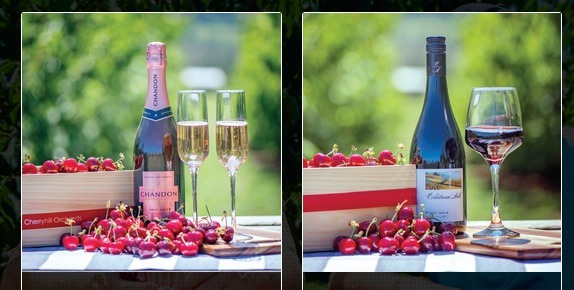 This year CherryHill launched their new corporate gift range, which showcases their biggest, sweetest cherries, handpicked from their Victorian orchards, combined with delicious local produce as well as choice of red, white, or sparkling wine from vineyards in the Yarra Valley. My gift arrived delivered in a beautiful wooden box, wrapped with a CherryHill ribbon, with a personalised gift card. 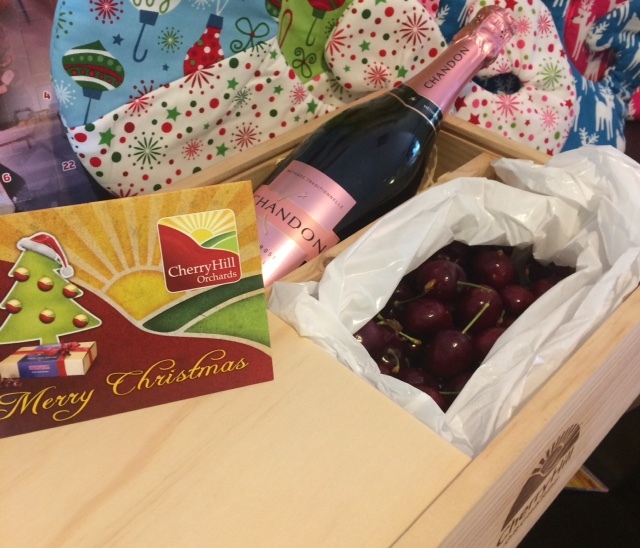 Two kilograms of sweet, quality, fresh cherries straight from one of Australia's finest cherry orchards, and a bottle of Chandon's Brut Rosé; who could ask for a classier gift? Enter promo code CH3RRY in 2015 for your free delivery when ordering two or more boxes of cherries*. 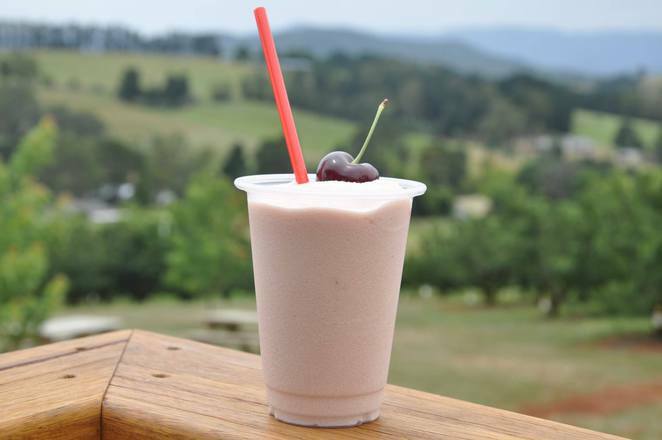 Cherry ice cream, cherry juice, cherry jam, and cherry dessert sauce are all available for purchase on site, with pick-your-own running 9am-5pm until mid January (closed Christmas Day), subject to season (see website to confirm). 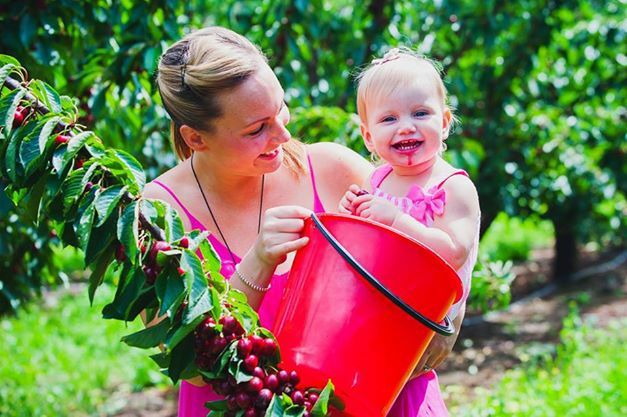 CherryHill Orchards grow over 30 different varieties of cherries at a number of locations around Victoria and New South Wales, allowing them to supply for the entire cherry season (November - February). A cherry is not a berry they are a drupe (flesh or skin surrounding a single stony seed); they come from the same family as of peaches and plums. --Cherries do not ripen after they've been picked. --There are thousands of different varieties of cherries, but only about 10% of varieties are produced commercially. --Different varieties ripen at different times; locations and climate are crucial to having the desired timing of the fruit. --Bees in springtime are crucial to the cherry production. In spring, CherryHill has hives placed in the orchard for pollination, they are later removed when the blossom has gone and the bees have finished their job. CherryHill is located in the Yarra Valley, 474 Queens Road, Wandin East, Victoria.